The Thunderbird was a “unique” looking bass in 1963… and still creates that same charming appeal to this day. 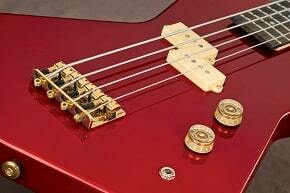 What made the Thunderbird bass a classic was not so much its distinctive look, but the way the guitar plays. The original Gibson Thunderbird version—with its neck thru-body, laminated neck, and expansive walnut wings proved to be an absolute tone machine; the resonance and quality of its dazzling, clean low-end rocks the jock strap off nearly any bass you put against bass guitars in even higher price brackets. Like Gibson, the Epiphone Thunderbird meets the high quality standard set by the Gibson Guitars Company exceptionally well. The Epiphone Thunderbird IV is lighter by comparison, as the Gibson Thunderbirds employ a mahogany body. 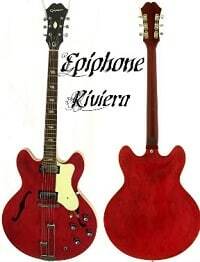 That said, both–the Gibson and Epiphone–Thunderbird basses are constructed with maple necks. The Epiphone Thunderbird IV Bass boasts that classic shape and a great sound. Its streamlined design is, of course, based on Gibson’s legendary original model. The Thunderbird IV lets you take full control of your tone with its 2 humbucking pickups, volume and tone controls. Alder body, maple neck, rosewood fingerboard… makes for the perfect guitar not only for a beginner, but for a gigging musician on a budget. Like all guitars by Epiphone, the Thunderbird IV has a Limited lifetime warranty. Buy it cheap! Looking for a different bass? 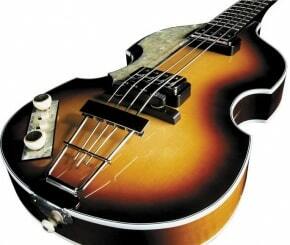 Read our article on Top Selling Bass Guitars. For more information, join our Guitar Community at www.gear-monkey.com guitar & gear forum to discuss the Epiphone Thunderbird IV bass guitar.